The Quantock Hills were England’s first Area of Outstanding Natural Beauty, being designated in 1956. 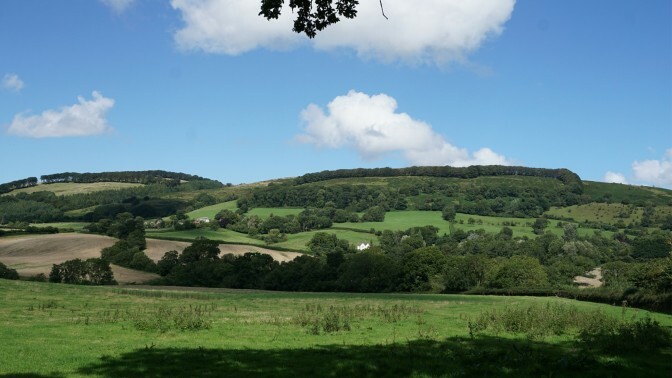 Now celebrating 60 Years, The Quantock Experience is a week of all things Quantocks, organised in partnership by Halsway Manor, National Centre for Folk Arts, South West Heritage Trust and the Quantock Hills AONB Service. In a week combining indoor and outdoor activities, talks, walks and experiences, discover and enjoy the landscapes, wildlife, history, geology, archaeology, folklore and crafts of this unique area. Come as a residential – or non-residential – visitor for the full week, come as a day visitor, or book for individual events. Halsway Manor is situated in the heart of the Quantock Hills Area of Outstanding Natural Beauty (AONB), with direct footpath access to open moorland and views to the Brendon Hills and Exmoor. Opening Lecture (7.30pm): Peter Haggett “A Quantock Light: Catching a changing landscape through Art”. Followed by local beer & cider tasting, and live music in the bar. Wildlife and Plant Identification walks with AONB rangers Owen and Nicola, plus Willow Workshops with Sarah Webb. Evening Talk (7.30pm): Tom Mayberry (SWHT) “Coleridge & The Quantocks” followed by Owl & Bat watching (AONB). ‘Flycatchers’ with Chris Jelley, Wild Skills with AONB ranger Nick, Song Walks with Bill Crawford, and Green Woodworking demos with Marc Cox & Richard Devaney. Evening Talk (7.30pm): Bob Croft (SWHT) “Quantock Archaeology” followed by an evening ceilidh with the Bristol Ceilidh Quartet. AONB Landscape Character Day: Morning talks by Hazel Riley (archaeology), Andy King (geology), and Emma Jane Preece / Chris Edwards (Landscape Character). Optional afternoon Dowsborough Hill Fort Archaeological Site Visit. Evening Beacon Lighting and Quantock Stories around the fire!Residents depart after breakfast on Friday morning. All Inclusive Tickets: Includes all talks, your choice of daytime activities, delicious home-cooked meals (all diets catered for), tea & coffee breaks, and evening entertainment/activities. Priority is given to those booking all-inclusive tickets. Full-Day Tickets: (Tuesday and Wednesday only) if available are priced £50 to include daytime activities, lunch, dinner, and evening entertainment/activities. Daytime Only tickets: (Tuesday and Wednesday) £30 to include activities and lunch. Evening Tickets: Mon, Tue and Wed evening tickets are available priced £10/ £4 full-time students. AONB Landscape Character Day: £20 to include morning talks, tea/coffee and lunch. Optional afternoon site visit free to attendees. Beacon Lighting & Stories event is open to all-inclusive ticket holders (residential and non-residential) and invited guests only. Sorry, no evening tickets available.